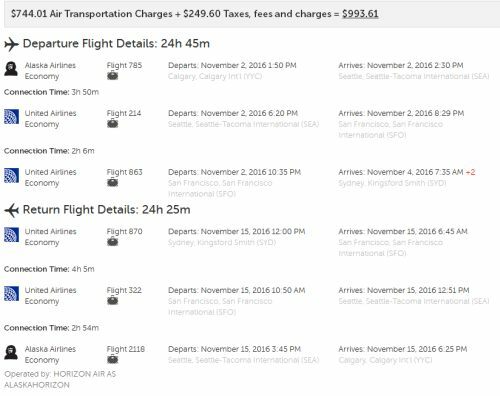 There are some unusually cheap airfares from Calgary to Sydney, Australia using Alaska Airlines and United Airlines. If you've tried looking for flights to Australia in the past 3 or 4 years, you've probably noticed they never go on sale, and don't drop much below $1400. Remember that Australia's seasons are reversed from ours. 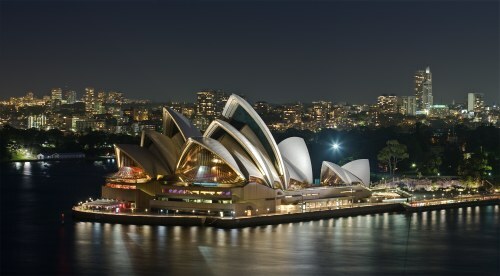 calgary, yyc, flight deals, sydney, australia, syd, alaska airlines, united airlines, australasia and oceania. 5 Responses to "Calgary to Sydney, Australia - $993 CAD roundtrip including taxes"
Just a point to consider, ... we booked 6 flights to Australia through iTravel2000 in 3 different bookings, through this blog and when we received our credit card statement, there was the charge shown in the booking (with a difference of a few cents up or down, depending on the US to Canadian dollar conversion). However, there is also another fee for between $25 and $40. for each booking that has also been charged to the card. We are true fans of deals.com, so we want to give a "heads up" to anyone booking through iTravel2000, that you may well be in for extra charges that you won't get through other sites. We ended up with almost another $100.00 in fees and when I called to inquire about these charges, the operator at iTravel couldn't explain. Thanks for the info. I can't think of what those charges would be for either. Third party booking sites generally do not charge anything for booking flights, especially when made online. I do recall someone seeing something similar happen to someone who made a booking through Flight Network. I believe they ended up getting those unexplainable, extra charges taken off. I'll make some inquiries at ITravel2000 and see if I can get an answer for you. Can't seem to find a flight for less than $1371.00 YYC to SYD. Anyone found a cheaper flight? I used the dates and the prices are all the same? David, this was posted over 2 weeks ago. Prices have likely changed. You may want to sign up for the YYC Deals Alerts to be notified when these deals come out.